"BOLD DESIGN DRIVEN BY PERFORMANCE"
The 6.2L V8, paired with the standard 6-speed manual transmission, offers 426 horsepower and 420 lb.-ft. of torque. Or opt for the high-tech combination of speed and efficiency of the 6-speed automatic transmission with Active Fuel Management. It offers 24 MPG highway and delivers 400 horsepower. The performance-tuned suspension with a finely tuned stabilizer bar and dampers provides an outstanding ride, balanced transitions, and excellent steering and handling. Pair it with the standard 20-inch wheels, Pirelli® PZero® summer-only performance tires, and Brembo® brakes for superior performance and control. Prepare for takeoff. Launch control on the manual transmission SS helps control wheel spin for a sports car that punches 0–60 in 4.7 seconds. TAPshift® manual controls, with steering wheel-mounted paddles, on the automatic transmission SS, give you command over the gear selection for an exhilarating sports car experience, while keeping the transitions smooth. 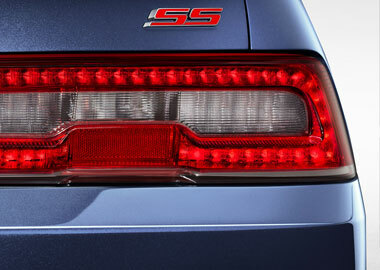 Camaro 2SS Coupe shown with available RS features including LED taillamps. 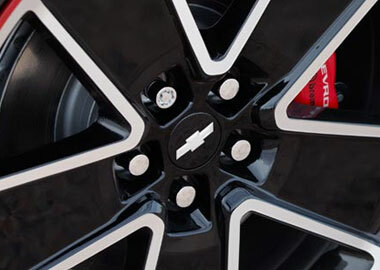 A 21-inch 5-spoke wheel is just 1 of 7 accessory wheels offered on Camaro. Camaro SS Coupe with available RS Package shown in Blue Velvet Metallic with functional hood extractor. 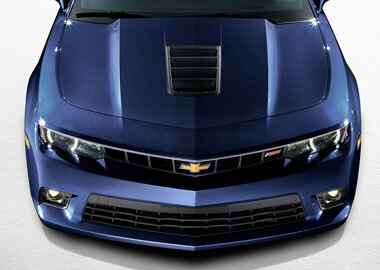 Every detail of the 2015 Camaro is designed to create an experience that’s as comfortable as it is exhilarating. From sueded microfiber details and dual stitching, to the available RECARO® Performance front bucket seats with larger bolsters to keep you confidently planted, Camaro’s interior exudes quality craftsmanship. Add the flat-bottom steering wheel, available with the 1LE package, to increase leg room for heel/toe shifting – a feature that will truly make you feel one with your sports car. You’ll find more than just top-level response with the Camaro steering wheel. Siri Eyes Free let’s you take charge with your hands on the wheel and your eyes on the road. Control audio functions with buttons right on the steering wheel. Plus, take advantage of the standard Bluetooth® wireless technology for select phones that helps keep you connected. The Color Driver Information Center on 2LT, 2SS and ZL1 models is designed to let you monitor your vehicle’s vital stats to ensure all systems are go: tire pressure, oil life, fuel range and more. From the intuitive instrument panel and revised climate control graphics to the four-pack of auxiliary gauges — standard on 2LT and 2SS — that includes oil pressure and transmission temperature, you’ll always be up to date. Standard on 2LT and 2SS, the color Head-Up Display (HUD) is specially designed for high-performance driving situations. The HUD presents performance data without requiring the driver to look away from the usual viewpoint. HUD displays speed, rpm, lateral g-force and more — even your radio station — right on the windshield. You can even customize the display height and intensity to best help you stay on top of vital information while keeping your eyes on the road. See more of what’s going on behind you with the available Rear Vision Camera, specifically designed to aid you in backing up. It works like an extra set of eyes. When in Reverse, the available 7-inch diagonal color touch-screen display presents a video image from the rear vision camera, showing objects otherwise blocked from view. Enjoy premium performance sound in Camaro with available Boston Acoustics® premium 9-speaker sound system. The 2014 Chevrolet Camaro Coupe has received the highest possible Overall Vehicle Score for safety –5 stars – and has received 5-star scores in every individual safety rating segment of the National Highway Traffic Safety Administration’s New Car Assessment Program. With OnStar® Automatic Crash Response, standard for the first six months on all Camaro models, you can be automatically connected to emergency assistance if a crash occurs — whether or not the air bags deploy.